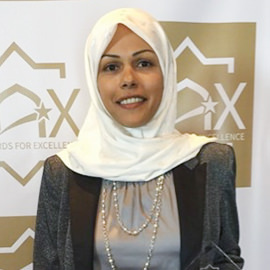 WATERLOO – Hind Al-Abadleh, associate professor in Wilfrid Laurier University’s Department of Chemistry and Biochemistry, was awarded the MAX Platinum Award of Excellence at the inaugural Muslim Awards of Excellence (MAX) Gala. Al-Abadleh was chosen for her excellence in the field of chemistry by a panel of judges and votes from the community, including the Laurier community. She has dedicated her career to creating awareness about the science behind environmental problems, and is an advocate for increasing the representation and support for women and under-represented groups in the physical sciences. Organized by Muslim-Canadian professionals in Toronto, the annual gala celebrates the achievements of Muslims in Canada. Al-Abadleh recently received funding for her research on air pollutants from the Canada Foundation for Innovation John R. Evans Leaders Fund. She is also the recipient of Laurier’s 2015 Faculty Mentoring Award, presented annually to a Laurier faculty member in recognition of their outstanding mentorship and support to undergraduate students and/or graduate students while the students are completing independent research.